Mutual Trust Bank Managing Director and CEO Anis A Khan and Software Shop Managing Director Sayeeful Islam exchange documents after signing an agreement on Indian visa application fees at MTB Centre in the capital recently. Mutual Trust Bank Limited (MTB) and Software Shop Limited (SSL) signed an agreement at a function at MTB Centre in the capital recently. Under the agreement, the clients of Mutual Trust Bank Limited (MTB) will be able to pay Indian Visa Application Processing fees using MTB internet banking service, said a press release. 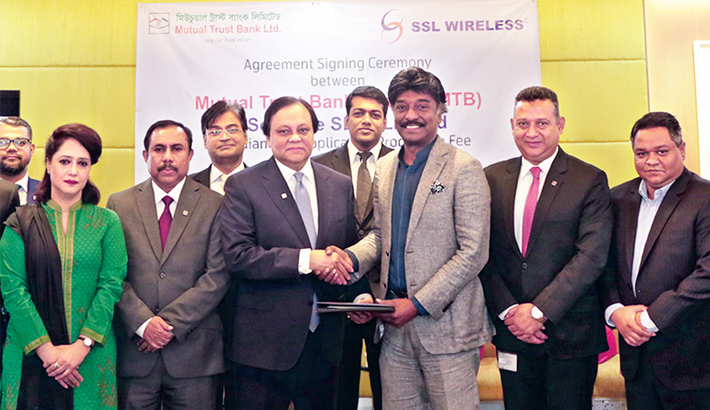 Anis A Khan, Managing Director and CEO, Mutual Trust Bank Ltd. (MTB) and Sayeeful Islam, Managing Director, Software Shop Limited (SSL) signed the agreement on behalf of their respective organisations. Syed Rafiqul Haq, Deputy Managing Director, Tarek Reaz Khan, Deputy Managing Director, Md. Shah Alam Patwary, Group Chief Information Officer (GCIO), Md. Rabiul Alam, Head of Alternate Delivery Channel (ADC) and Samia Chowdhury, Deputy Head, Group Communications of MTB were present on the occasion.